Driving from coast to coast to coast to coast not only expresses exceptional internal freedom, but it reintroduces you to a country that’s filled with exhilarating picturesque dreams. In one area, the clouds may produce the natural color of milk or maybe even a reflective, unblemished fresh snow; while the next town introduces a brand new stage of “I’ll blow your mind!” Yes, driving across America and breathing in a numerous 3-D scenic geography or appreciating the unfamiliar small things such as speech, clothing and attitude, is a historical seminar in itself. Ladies and gentlemen, it doesn’t get much better than this. This is Main Performance’s Domestic and International Traveling at its very best. (https://mainperformanceusa.com). After spending only two days of a well-planned seven day stay in Pittsburgh, Pennsylvania (my hometown),we decided to abruptly interrupt our schedule for a couple of days. Glorietta and I had arrived in “Steelers’ Country” on August 2, 2014 to attend my 50th year two day, Penn Hills Senior High School Reunion which was being held at the Monroeville Doubletree Hotel. I was born in “The Burgh” and was more than prepared to visit a collection of family members and business associates who are actually an extension of my family. Therefore, this entrepreneur, entertainer, author, quickly dialed up two of his close colleagues, Bob and Darcy Kuhn, who have been my dear friends for close to thirty years. When in town, we usually drive out to their suburban home for delicious cocktails, superb wines and unbelievable fantastic dinners. In fact, Glorietta and I often tell everyone within listening distance that Darcy Kuhn is one of the best cooks ever. But this time, she and I were surprised to find out that we were in store for a very different scenario. But, then again, Mr. and Mrs. Robert Kuhn possess such a high level of class and wisdom that whatever they choose to decide for an intimate gathering has been known to occasionally catch me off guard. After all, when it comes to intelligence, common sense and class, you either have it, or you don’t. And…not only do the Kuhn’s have it, but, more than their fair share! “Hey Tito, I spoke with Darcy and we decided that instead of getting together at our home this time, why don’t the two of you drive up an join us over night at our lake house in Chautauqua, New York,” Bob offered while presenting his change of venue? “By the way, it’s located on a canal near the legendary Chautauqua Institute,” he continued. “Now I realize that Glorietta and you have driven thousands of miles across the country, but together, Darcy and I figured you wouldn’t mind driving that extra mileage considering you’ve never been to our lake house as of yet. Besides, it’s our weekend home and this will also give “us” a day away from business concerns and believe me, we can definitely appreciate a day off. Tito, you must admit it’s an offer you can’t refuse,” Bob announced while using his best Don Vito Corleone (Godfather) imitation. “How can you pass it up?” Of course, he already knew that he had me at “Lake House.” After that, how could I refuse such an enticing offer? Bob and Darcy Kuhn, one of the east coast’s most respected couples, are entrepreneurs as are most of my friends. She takes care of their office responsibilities and he performs their out of office obligations. These two business partners own quite a few rental properties and quite naturally, have good days and bad days, just like you and me. So, it goes without saying that this husband and wife team work hard for a living and obviously, receive less relaxing time than they would want. As we drove the busy highway on our way to Lake Chautauqua, New York, my mind instantaneously brought back rich youthful memories of days gone past. Many times I’d driven this highway before, not to forget the rustic winding back roads with their bucolic atmosphere. In retrospect, it did cause me to reminisce about glory days, that is, long before the East Coast recession of the 1980’s and 90’s caused me to move three thousand miles across the country and therefore, become a resident of Southern California. Looking back, I easily recalled the revolving dedicated personal visits I made with friends and business associates alike, driving to this place or…to that town as expected. In those good old days, business careers and partying times were appreciated by all. It was then while reminiscing, that I spied the highway’s exit signs of mileage informing us how long a continuous drive we’d have before reaching Erie or Conneaut Lake, Pennsylvania, and then, Chautauqua County, New York. 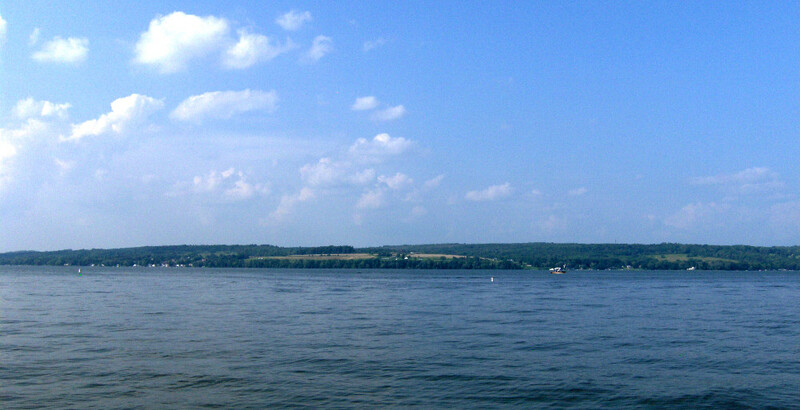 Chautauqua Lake is located entirely in Chautauqua County and Chautauqua County is located in Western New York State. The lake is approximately 17 miles long and 2 miles wide at its greatest length. The surface area is around 13,000 acres. Its maximum dept is about 78 feet. The area, just like the sophisticated residents and business owners, are considered a class act by anyone in the know. It’s located about three hours from Pittsburgh, Pennsylvania. Friends of the homeowners along with tourist, can rent boats, golf, explore scenic parks, fish and camp, rent cottages, enjoy heated indoor saltwater pools and spas, wineries, comedy festivals, rodeos and just about every other entertainment event possible on land, water and snow. Chautauqua Lake will blow your mind once you get out on the lake and boat to a host of fantastic restaurants and night clubs. If you’re lucky, you may even be fortunate enough to purchase tickets to one of the many programs held at the famous Chautauqua Institute. Remember…I said if you’re lucky! In fact, the Chautauqua “I love New York County” Visitor’s Guide, published by Chautauqua Institute, asks their readers, “What Would You Like to Read Today?” And speaking of learning, Chautauqua County believes that everyone has a right to be all that he can be…to know all that he can know. For complete information contact: Chautauqua County Visitor’s Bureau at info@tourchautauqua.com or you can go online to their website at http://www.tourchautauqua.com. Upon arrival at Bob and Darcy Kuhn’s lake house, Glorietta purposely drove up and down the lakefront community in order for us to get a particular view of the entire neighborhood. “Wow,” we both said out loud. “We’re definitely going to have a tremendous stay on this lake!” I still remember thinking, “Too bad the invitation hadn’t been for a week!” At the time, she and I could not help stopping to stare at the rear of their home while falling in love with the Chautauqua Lake that’s known for surrounding the area and you would too! Expecting their friends to show-up on time, Bob and Darcy swiftly greeted us as we were pulling into their driveway and then, helped us unpack our vehicle. While walking up to the rear door, we noticed a children’s playground to the right side of their house filled with swings, sliding boards and every inviting toy a child could ever want. Naturally, this present scene served as a notice of just what was awaiting inside causing our expectations to enhance. Entering the lake house was astonishing. To the right was a swimming pool room. The pool was one half swimming pool and one half spa combined into one. I couldn’t believe it and this was just upon entrance. No wonder the Kuhn’s drive up each weekend for immediate relief away from business irritations. To describe the house using the very minimal of words, there is one bedroom on the first floor with a bathroom and a huge kitchen-living room. Walking out of the back door introduced a nice size yard that had been separated into three areas. To the right was a set of comfortable chairs lined up around a fire pit. In the middle stood a rather large picnic table that faced the canal where their Pontoon boat had been parked. To the left, there was a Bar-B-Grill and a ramp that made it easy to carry gear over to their boat. And…did I mention the backyard? Well, to make this part of the story brief, their property encompasses around three fourths of an acre. Yes, most of the area, front and back, is a giant yard of created comfort. Now the upstairs of the house is a horse of an all together different color for there are four additional bedrooms and another bathroom. There’s also a large glass sliding door where the owners and guests together, can step outside and easily be seated on a stylishly carved wooden balcony. Outside on the balcony, we sipped cocktails and enjoyed the backyard canal’s view. In fact, there are a host of elegant wood carvings everywhere you look, both inside and outside the house. Let’s face it folks. Pittsburgh natives Bob and Darcy Kuhn personify success in a most productive way. They live the life most people only dream of living and this weekend, so does Tito Luv and Glorietta Valentino. Downstairs, we sat comfortably at the bar feasting on Darcy’s freshly prepared Crab Croissants with various other tasty selections of finger foods that melted in our mouths and not in our hands. Later in the day, Bob and Darcy surprised us yet again. Simultaneously, they announced that she’s too busy with business concerns to prepare the scrumptious meals of yesterday and instead, we would all soon depart to the water where visitors can observe the numerous amazing sights, taste desirable cuisines while learning to appreciate Chautauqua Lake as much as the locals do, which was more than okay with us. After a short stint, everyone returned to their bedroom and dressed quickly for an evening out on the lake. Stepping on to the Pontoon Boat reminded me of my youthful partying days. Yet, the neatest part of our first boat ride that day was when Bob pointed at the up and coming canal bridge playfully yelling,” “Hey Tito, Glorietta, you’re going to have to duck down in the boat once we approach the canal bridge. Sometimes when the water is high after it rains, we can’t even go this way. Okay, now duck down!” And the four of us did just that. In a strange kind of way, it was quite exhilarating as the four of us laughed and mumbled an abundance of well choice words as we did indeed get down on our knees. A few seconds later, the next thing we saw after the canal bridge had been completely cleared was the beautiful Chautauqua Lake inviting us to take a royal cruise around the lake. The deep blue rolling waves presented a breathtaking picture. I truly felt like I was in a Hollywood movie. Of course, several associates of the Kuhn’s passing by in their boats began speaking and waving their hellos as they glided by, while Bob eagerly returned their greetings expressing that these were his friends Tito and Glorietta from California. Then, everyone waved smiling back and forth as each boat passed. Our good times were only beginning to roll. Watching Bob drive his boat and at the same time give extensive information about the area as we traveled across the lake, gave me a new incite of my two friends. He played special CD’s that Darcy had personally recorded for our stay, that produced incredible sounds from the Beach Boys, Motown and other finger snapping tunes we’d all grown up with. She also, made duplicate copies and handed us four CD’s to take home for our listening pleasure. Her fostered creativity certainly made our day. This visit just kept getting better and better. The Kuhn’s Pontoon Boat usually presented a well stocked bar to its passengers. However, no one actually wanted a drink as of yet considering that we hadn’t reached our first destination. Normally, the bar’s stocked for guests who are sitting outside in the Kuhn’s backyard enjoying rather lengthy chit-chats during weekend barbecue get-togethers, as they while away splendid hours of satisfying glory. Nevertheless, what truly impressed us were the innumerable elegant homes along the lake. What kind of work did the owners of these plush lake mansions perform for a living? I could not write about the loveliness surrounding this formidable body of water and not include photos for you that broadcast such esoteric character. Check out the fun we had at The Watermark Restaurant!